During our stay in Las Vegas while attending 2013 CES we resided at Harrah’s Las Vegas hotel and casino. We first arrived by shuttle that took us directly to the hotel for $13 round trip per person. When we arrived we were dropped off at the rear of the hotel which is where the guest check-in is located. Our check-in wasn’t for another four hours but we were given the option to pay an early check-in fee or they had a suite upgrade available for a few dollars more. We opted for the suite upgrade. Our room was quite large which included a sofa, desk, game table, wardrobe, entertainment center and king size bed. The only complaint I have is that the room was freezing. The day we arrived was the coldest day out there and temperatures rose to sixty degrees by the time we departed. It was quite nice since the weather had been in the teens back home. For some reason we never could get the heater to heat up very quickly but we never did contact the front desk to have it looked at. 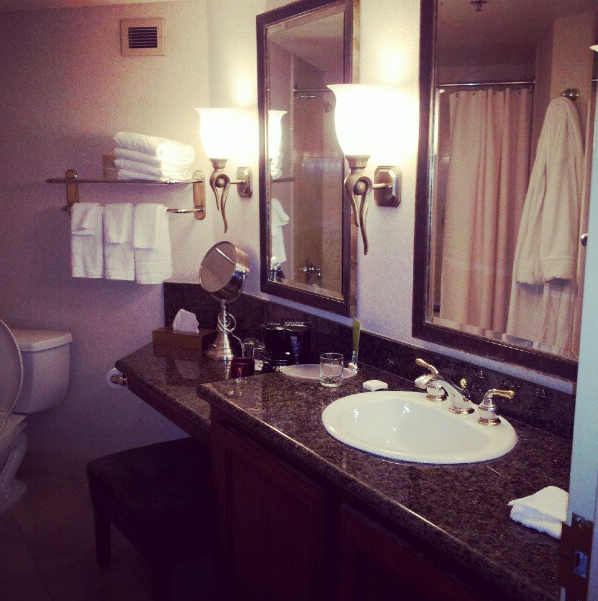 The bathroom was large with a tub/shower and large vanity. The suites also came with a mini fridge, safe and 2 robes. I enjoyed the robes. They were very soft. 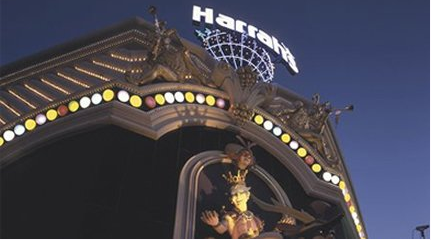 Harrah’s Las Vegas offers a wide variety of dining and retail options. They also have a spa, health club, salon, entertainment and outdoor swimming pool. Sadly, we did not have the time to take in any of these amenities. The business center at Harrah’s Las Vegas offers computer workstations, laptop hookups, email, color laser printer, color copies, fax, and various other office supplies. Since I was attending CES I was able to do my work in the CES press rooms but this is definitely a nice feature would I need it next visit. They also have a Total Rewards card that you can use to get discounts on dining and entertainment. The rewards also add up depending on what you spend so you can enjoy comps such as a free night stay. We already had a Total Rewards card from a previous stay at Bally’s Las Vegas. The Total Rewards cards are good for Caesars Palace, Planet Hollywood, Paris, Flamingo, Rio, Harrah’s, Bally’s, and The Quad. We did enjoy a few of the restaurants in the hotel including Flavors The Buffet, Toby Keith’s I Love This Bar & Grill, Harrah’s Cafe and KGB: Kerry’s Gourmet Burgers. 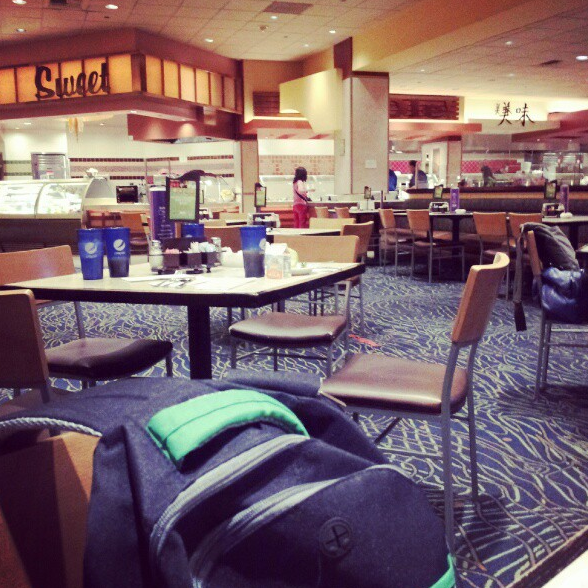 At Harrah’s Cafe we had breakfast. It is ridiculous that they charge you for every tiny thing. I asked for a side of salsa to enjoy on my omelet and it was an additional $1.99. Are tomatoes really that expensive? However the food was very good and my husband loved the french toast. Toby Keith’s I Love This Bar & Grill was a very fun and upbeat atmosphere with country music playing. They also offer a full bar, televisions with music videos, and a stage area where they feature live bands. My husband enjoyed a steak and I had a country fried steak. The meal was very good and filled us up. It cost us around $50 which included 2 beers. The waitress was very nice and we gave a good tip. For our last breakfast, we decided to try Flavors, The Buffet for a quick breakfast. It was $19.99 per person which included a drink but still plenty expensive. The buffet was set up with an around the world style theme. They had an omelet station where you could have one made to your desire. I was excited to find salmon on the buffet but it was ice cold. I’m not a lover of sushi so this wasn’t for me! My husband and I did enjoy eggs, bacon, sausage, french toast and a small cinnamon roll. It definitely filled us up until late afternoon. On our last day we had to check out at 11:00 am but we did not have to leave for our flight until 4:00 pm. We called the bell men at check-out and they quickly got our luggage to keep until we had to leave on our shuttle to the airport. There was no fee for this service although we did leave them a nice tip which I’m sure they appreciate. It definitely made traveling easier and left us with a peace of mind knowing our luggage would be there when we were ready for it. They also offer a luggage service to conveniently take your luggage to the airport for you for $10 per bag. The hotel also had various kiosks to easily check-in for your flight and print boarding passes which is great. I mean, who wants to get in that dreaded B or C line when you’re flying Southwest? Be sure to follow us on instagram and twitter to get up-the-minute updates while we are on the road or attending events.